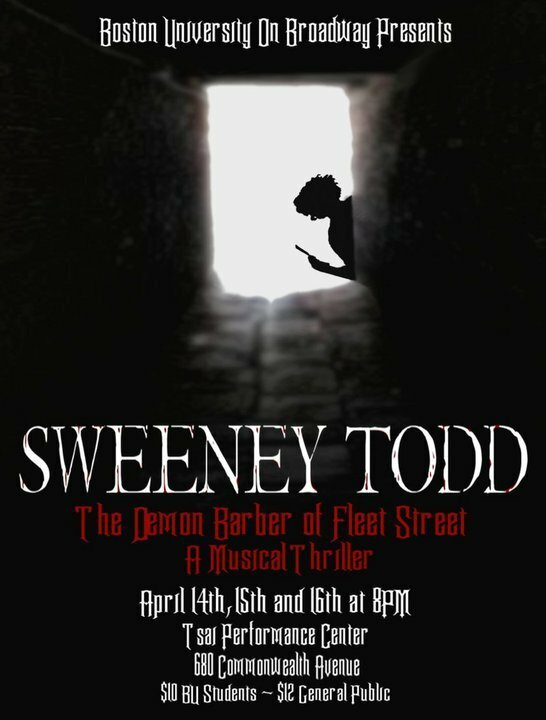 BU On Broadway’s Sweeney Todd premiered last night and will continue all weekend in the Tsai Performance Centre at 8pm. The production was a breath of fresh air in BU theatre as it united some of the school’s absolute brightest talents against the backdrop of a challenging and entertaining piece from Stephen Sondheim. Directors Jillian Angelone and Brian DeVito brought a superb mix of expertise to the table in their first directing effort with OB. DeVito, a theatre design and production minor with a resume full of tech work, gave the creative crew a solid foundation of practical experience, setting the tone for the excellence achieved by the lighting team of Joe Colombo and Jan P Kaim and the set designers Brittany Hayes, Jimmy Ikeda and Preston Weir. The set struck the perfect balance between artistic symbolism (the bird cage look of Judge Turpin’s house) and functionality (the raised barber shop that allowed actors to fall safely to their “deaths” in the space behind Mrs. Lovett’s worktable). Even the sound board, often the most difficult to master element of tech in student theatre, was run decently. Prop mistress Jess Couture set the stage for some brilliant effects with sensational razors that shot blood as Sweeney cut throats, and Molly Coyne and Rebecca Karsh’s team costumed the characters simply but beautifully. It’s also worth noting that this was the most efficient build/run crew I’ve seen at BU, making the obligatory blackout-set changes tolerable. The other director, Jillian Angelone, is best known as a performer on the BU stage. Armed with musical expertise and a phenomenal voice herself (on top of solid acting technique), Angelone’s influence was abundantly clear throughout the piece. With few exceptions, everyone was cast in the perfect role for their voice. Characters were well-developed and scenes effectively blocked. Though there were perhaps a few too many people in the ensemble, each one of them contributed to filling out the world of the show. The director’s note suggested that their interpretation was going to be very dark, almost a thriller, but the humour was carefully carved out and played in the moments when it could be, left at the door for the darker scenes. Musical director and conductor Jonathan Brenner led a capable orchestra through Sondheim’s difficult score, but it was the voices that really stole the show. In his year-long absence from the stage, I’d grown accustomed to musical casts that didn’t include Chris Behmke. But when he reappeared as the title character in this production (after a semester abroad and a turn in the director’s chair) I was quickly reminded of how much better off a show is with him in it. There is really no arguing with that voice, especially good when pushed down from his natural tenor into the baritone range where it really shines. Stephanie Gray was returning from an absence too, having music directed last semester. One of My Theatre’s favourite musical theatre actresses, Gray was also sorely missed when she wasn’t performing and we couldn’t have been more excited to see the sunny singer’s take on the twisted Mrs. Lovett. She didn’t disappoint. Rather, she exceeded every high expectation I had of her, proving both hilarious and affecting in the tricky role. Carl Welch also stole his scenes as the beastly Judge Turpin. Shedding all the sweetness that marked his excellent turn as Collins in last semester’s Rent, Welch rededicated his outstanding voice to a remarkably brave turn as the creepy villain of Sweeney. Without his program bio it would have been impossible to tell that Welch is only a freshman, his low voice and mature presence allowing him to read unquestionably as the oldest character on stage. The other principals managed their roles with less ease than the incomparable aforementioned three. Jack Moriarty and Cara Grimaldi had nice moments as Antony and Johanna (“Kiss Me”, in particular, was quite good), but they both struggled with their more famous songs and didn’t flesh out their characters in particularly interesting ways. Johanna, whether it was a direction issue or the fault of Grimaldi herself, suffered from an unfortunate case of ingenue-itis and a truly terrible wig, two afflictions very difficult to recover from. Austen Hallett was a mixed bag as Toby. I loved him in the first half- all childish zeal and believable depth-, but he faltered on my favourite song of the show, “Not While I’m Around”, and was played as more dumb than naive in his later moments. Colleen Martorano predictably nailed her vocals as the Beggar Woman but didn’t give the character any of the depth to foreshadow the eventual reveal of her identity. As Beadle Bamford, Michael Butvinik oscillated between wonderfully funny and a bit much, as did Melissa D’Anna as Pirelli. But despite her broader moments, D’Anna’s perfect comic timing made her a highlight. The high-voiced spitfire was virtually unrecognizable with her mustache and baritone Italian accent- all the more impressive when she seamlessly switched to Scottish. The other accents in the production faded in an out seemingly randomly. Gray fared the best, holding on to her strong cockney for most of the play, but the inconsistency did mildly annoy. But when I say mildly, I do mean it. As a whole, OB’s Sweeney Todd was a remarkable production. The directors led a truly capable team in making a production of consistently high quality. From build/run members to violist #2 straight up to Chris Behmke thankfully back in the leading man spotlight, the Sweeney team was batting .1000 this weekend.